The EB-5 Visa is a way to get permanent residency as well as green card through investment. The USA immigrant investor program enables the foreigners to make an investment in the US business to obtain the green card and helps them to become the lawful permanent resident. And they can eventually become the permanent citizens of the US. The investment can help them get a green card for the investor to permanently live as well as work in the US along with their spouse and unmarried children under the age of 21. 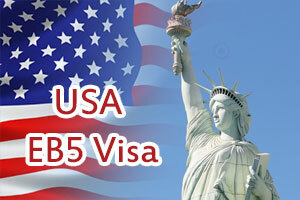 The EB-5 visa program is operated by US citizenship and immigration services (USCIS). This program was established by the US Congress in 1990 to facilitate the increased investment in US economy. The foreign investor should be willing to make a risk capital investment in US business entity for profit. The essential investment amount which is required is $500,000 or$1 million, again depending on which project they invest in. If they invest in targeted employment area (TEA) the investment is $500,000. If they invest elsewhere, the minimum required investment is $1 million. The eb-5 investment must lead to the creation of 10 full-time US jobs for at least two years. How many EB-5 investor visas issued each year. USCIS does reserves 10,000 visas for USA EB5 Visa for EB-5 investors each fiscal year. It can be observed that this 10,000 visa quota has never has been met. There has been a drastic increase in the number of EB-5 program participants in the year 2011 and more than 3000 investors apply for this program. We find roughly about 3,500 USA EB5 Visa was issued in the fiscal year 2011 which marked an 80 % increase from the year 2010. The growth has been recorded, and it can be attributed to increasing the confidence in the program because USCI maintains transparency as well as efficiencies in the application process as well as growth in the number of regional centers established across the US. What are benefits of applying USA EB5 VISA?